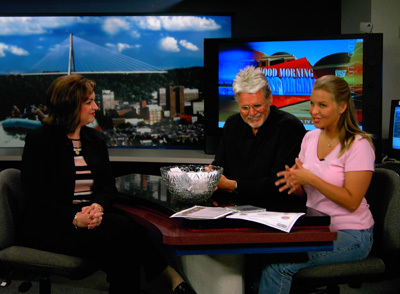 Con and the IMMI team visit Charleston, WV for the next stop on the Shoot From the Heart promotional tour. The Charleston leg begins with an early morning visit (try 5:30 am!) 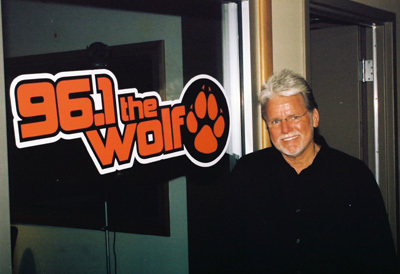 to Charleston's best radio station, WKWS-FM, 96.1 The Wolf. Con visits with Mike and Amanda, the morning team for 96.1 The Wolf. Con and Amanda share a seat since there wasn't a lot of room in the studio. Poor Con, what a hardship! Con spends most of the morning with Mike and Amanda, taking calls from Charleston area listeners, playing songs from the CD and talking about the making of Shoot From The Heart. 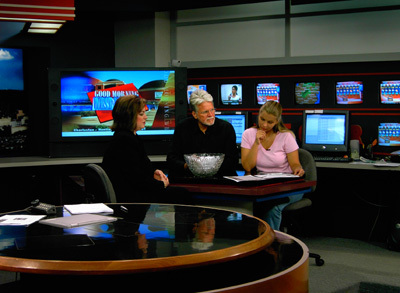 Con heads over to WCHS-TV, the local ABC affiliate in Charleston for an appearance with Jenifer McAndrews, the morning news anchor of Good Morning West Virginia. The big fishbowl in front of Con is full of names of listeners of 96.1 The Wolf and viewers of WCHS-TV, TV-8, who called in for a chance to win a trip to see Con at the Rhythm In The Hills music festival in Pigeon Forge, TN, sponsored by Mountaintop Resorts, IMMI Records and Lundy Associates. The trio share a joke just before drawing the lucky winner. Click here to watch a short video clip of Con drawing Lisa Stover of Charleston's entry from the fishbowl. Lisa won two 3-day passes to see Con and other great performers at the Rhythm in the Hills Festival, plus two night accommodations in a luxury cabin at Mountaintop Resorts, and $100 gas money from IMMI Records.